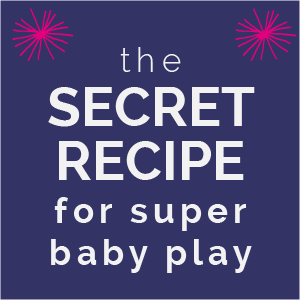 This activity has been a big hit since the launch of my book, Simple Play: Easy Fun For Babies. It takes an inexpensive item you very likely already have in your home and capitalizes on your baby's developmental interests in the first year - namely exploratory sensory play through touching, grasping and mouthing. This is one of the 40 activities in Simple Play that prove you don't need to be artsy or crafty, have a Pinterest-worthy playroom or a house-full of expensive toys in order to play in ways that promote your baby's cognitive, motor and sensory development! FiIl a room with store-bought baby toys and your little one might spend most of her day interacting with soft plush toys and smooth hard plastic. But to fully develop the tactile (touch) sensory system, it's important for your little one to interact with a wide variety of the textures found in our everyday lives. Learn more about sensory play for babies. Food makes a great sensory play material - even when it’s not mealtime. Learning to touch objects that are a wide variety of textures - wet, slimy, sticky, bumpy, scratchy, etc. - is an important part of healthy sensory development. Through positive, playful interactions with textures, your baby learns that these new sensations are not threatening or uncomfortable. The brain's ability to accurately receive, interpret and respond to tactile sensory information from the skin is an important foundation for self-feeding skills, for participation in grooming activities (hair brushing, fingernail cutting, toothbrushing, etc. ), and for fine motor coordination. It's hard to believe but absolutely true that how our babies play today can impact their skills and abilities in the future! Thoroughly wash and peel a carrot or two, placing the peels in a shallow container or on a high chair tray. With close supervision (eyes on baby within arm’s reach), let baby explore the cool, wet peels through touch and mouthing. Make sure baby doesn't bite off and swallow large chunk of peel (unless you're doing Baby Led Weaning and you're comfortable with that). This activity is great for babies from the time they can grasp well into toddlerhood. Here are some tips for setting up the activity for babies who can't yet sit. My hope is always that my activity ideas would be a jumping-off point for parents and caregivers and spark a creative enthusiasm for finding new ways to engage with your kiddos. Why stop at carrot peels?! Try sensory play apple peels, vegetable peels, thin-sliced zucchini, spaghetti squash, fresh herbs, kale, cooked noodles and more! Learn the three ingredients to developmental fun for your little one from birth through rolling! CLICK HERE for the recipe for babies who sit up and beyond! How did you hear about CanDo Kiddo?